Posh midfielder Martin Samuelsen somehow failed to convert this Marcus Maddison cross against MK Dons. Photo: Joe Dent/theposh.com. Michael Bostwick blocked a few shots and Marcus Maddison made a few promising runs. 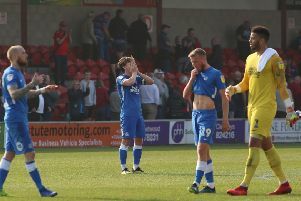 But that was about it from the Peterborough United players as the crashed to a terrible 4-0 home defeat at the hands of MK Dons today (January 28). MK Dons 'keeper David Martin beats Posh centre-back Ryan Tafazolli to a cross. Photo: Joe Dent/theposh.com. Posh forward Paul Taylor shows his disappointment after MK Dons make it 2-0. Photo: Joe Dent/theposh.com. Gwion Edwards: (for Forrester, 66 mins). Tom Nichols: (for Angol, 66 mins).